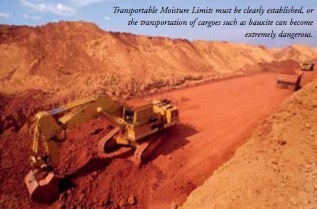 The Association of Bulk Terminal Operators (ABTO) has warned that cargo liquefaction — an issue commonly associated with the seaborne transportation of unprocessed mineral ores and concentrates — is also an issue which bulk terminals need to pay attention to. At the 3rd session of IMO’s Sub-Committee on Carriage of Cargoes and Containers (CCC), it was agreed to draft new IMSBC amendments classifying coal as a Group A&B cargo and to push through amendments specifying that the "shipper shall be responsible for ensuring that a test to determine the Transportable Moisture Limit [TML]... and that the shipper shall be responsible for ensuring the sampling and testing for moisture content”. This test procedure details the laboratory determination of TML for coals up to a nominal top size of 50mm. The procedure is based on a modification of the Proctor/ Fagerberg test involving testing of a coal sample of up 170kg. While the IMSBC Code applies primarily to the seaborne carriage of cargoes, Adams said there is a “definite crossover”, but bulk terminal operators are often left behind during the regulatory decision-making process which, given that five billion tonnes of bulk commodities are transported annually, needs to change. “There has to be greater representation at IMO. Liquefaction remains a serious concern for all sectors of industry but there is no international legislation governing the storage, segregation, handling and monitoring of such cargoes at the terminal — only guidelines,” he said. HME and to source the necessary cargo residue and wash-water reception facilities,” he said. The certification of HME cargoes was also considered problematic, with ICHCA members commenting on a perceived increase in the number of falsified TML certificates. This, many agreed was due to the lack of mandatory procedures for carrying out TML tests and full depth sampling of stockpiles, which ports will restrict for obvious safety reasons.